KUWAIT: NBK Capital, a leading regional investment firm, participated in the recent Petroleum Economist Energy Strategy Forum held in Kuwait City. 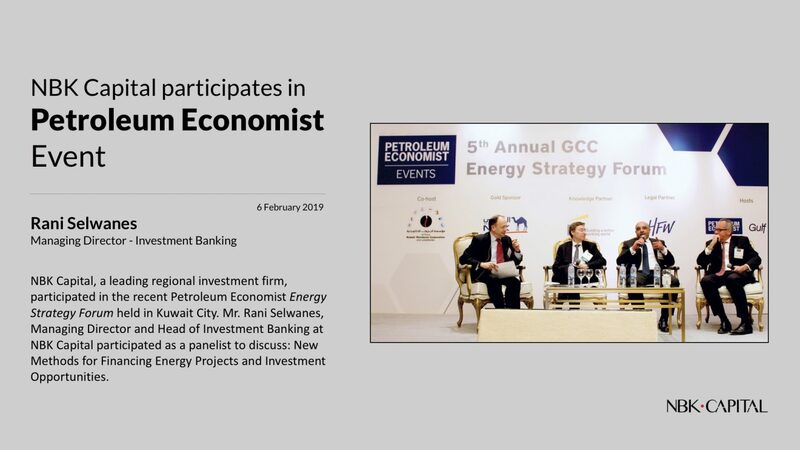 Mr. Rani Selwanes, Managing Director and Head of Investment Banking at NBK Capital participated as a panelist to discuss: New Methods for Financing Energy Projects and Investment Opportunities. The forum highlighted the important factors impacting energy strategy in Kuwait and the GCC states. Keynote speakers included HE Dr. Khaled Al-Fadhel, Minister of Oil, Electricity and Water; Mr. Hashem S. Hashem, Deputy Chairman and CEO of Kuwait Petroleum Corporation and Mr. Abbas Al-Naqi, Secretary General for the Organization of Arab Petroleum Exporting Countries. A world-class investment house, NBK Capital’s customer-centric approach provides forward-thinking solutions that address the specific investment needs of clients and investors, institutional customers and high-net-worth individuals. consistent government debt issuances and the mar-ket eagerly looks forward to seeing a revision of existing laws that currently limit the ability of the State from doing so.